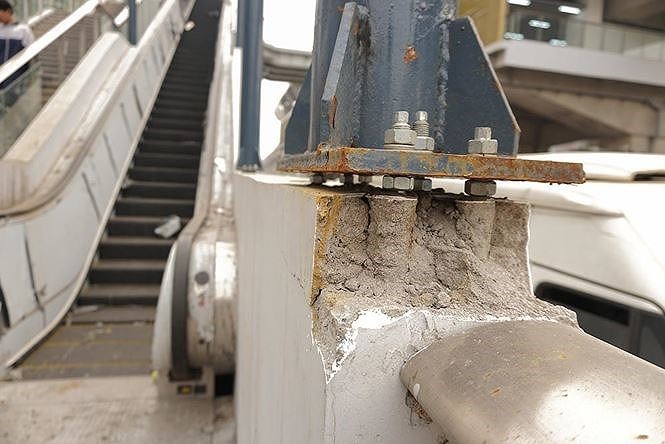 HÀ NỘI — In response to reports of broken glass and concrete along Hà Nội’s Cát Linh-Hà Đông elevated railway, the Ministry of Transport on Thursday reassured the public that damage would be checked and fixed soon. At the ministry’s press briefing on Thursday, Vice Director of the Railway Projects Management Board Vũ Hồng Phương said that the project had not been completed and any problems would be solved before it is handed over for commercial operation. Phương said that only 1 per cent of work on the metro is left to be completed, including roofs, escalators and decorative plants. “All of the work, as well as repair of any damage would be completed in April,” Phương said. Deputy Minister of Transport Nguyễn Ngọc Đông said that the metro was planned to go into commercial operation in April and there are many things to do before that. Đông said that some of the most important works include assessing the safety of the whole metro system and examining the trains and equipment. He added that because Việt Nam did not have specific quality assessment standards for urban railways, authorities found it difficult to examine and register equipment used. The transport ministry was the investor of the project but Hà Nội People’s Committee would be responsible for managing, operating and maintaining the urban railway, which would cause some difficulties, Đông said. “Both investors and contractors are determined to put the urban railway into operation by the end of next month,” Đông said. On March 15, Transport Minister Nguyễn Văn Thể visited the urban railway line and saw a trial run of the metro. He asked the project management board to work with contractors to address any problems. “Once the urban railway starts commercial operation, the whole system must be certified to ensure safety,” Thể said. The Cát Linh-Hà Đông line runs 13.5km with 12 stations, including Cát Linh, La Thành, Thái Hà, Láng, Thượng Đình, Ring Road 3, Phùng Khoang, Văn Quán, Hà Đông, La Khê, Văn Khê and Yên Nghĩa. The track is designed for speeds up to 80km/h and trains would run every 3-5 minutes.